For the 2017 year, Klim has refined their adventure motorcycling product line and introduced the Carlsbad Jacket as the streamlined and affordable option for riders that want all of the classic Klim functionality without all the bells and whistles that they don’t need. For the Carlsbad that means you’re looking at a Gore-Tex shell that’s guaranteed waterproof for life, heavy Karbonite™ fabrics at the key impact and abrasion points, six vents that let the jacket stretch into the warmer months, and a full set of CE level 1 armor including back protection. What you won’t get with the Carlsbad is a bulky, overly-complicated jacket. The outer layer has been cleaned up stylistically, so while you still get zippered venting, pockets, and fit adjustment; you’ll have more clean-looking, large panels of material instead of a complicated layout of minor features. And that simple effectiveness makes the Carlsbad ideal for road riders that don’t need the off-road technicality of something like the Badlands. But it also works for off-road adventure riders that want a simple, yet entirely capable jacket that won’t break the bank. I purchased this jacket based on klim’s reputation for making high quality off-road protective clothing and so far I am impressed. While >$500,- is not cheap the quality and finish of the jacket is top notch. I have not ridden in very have rain yet it did keep me dry in fog / misty rain. Yes I would recommend this jacket. I do have other klim pants and jerseys and they work very well. Just received my Carlsbad jacket. First ride out, went from 85 degrees and sun to pouring rain and 51 degrees. Performed great, stayed comfortable and dry! Almost all my riding is through the Colorado Rockies and this is the perfect jacket for meeting all the varying conditions that can happen within the course of the day.Plenty of room for layering up when the weather turns colder. Quality and attention to detail is outstanding! I'm 6'1' 200 lbs and the large was a perfect fit. Do you have an estimated in-stock date for the XXXL brown Klim Carlsbad jacket? BEST ANSWER: This jacket in the 3X is actually a special order item which can only be ordered over the phone at this time. Special order items may take about a week to deliver after the order is placed. 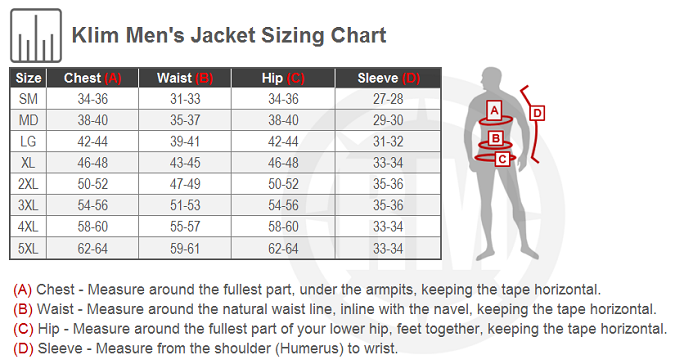 How are the KLIM jackets sized? 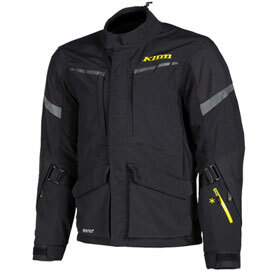 BEST ANSWER: Our Klim Jackets are average in size. We do offer a sizing chart on our website, that you can key your information into. Is this jacket available in large/grey? Does it have a two way zipper on the main front zipper?